Introduction: The following selection is taken from “Harts Lake School: Symbol of Pioneer Education” by Arthur Martinson and Ronald Magden. Our thanks to the Harts Lake Historical Society for granting permission to use the text and pictures found below. More then fifty years have passed since the last students shuffled feet under desks in the one-room schools near Roy. Those students lived in a time when Americans walked more than they rode, and when space and distance were everyday facts of life. Since it was necessary for students to walk, schoolhouses were located within a few miles of several families. Because of the small number of children involved, local school districts combined all eight grades in one room with one teacher. From the 1860’s to the 1930’s, fourteen country schools served isolated farm and logging families in the greater Roy area. Those one-room schoolhouses surrounding Roy did not follow a particular architectural model. During the 1860’s and the 1870’s, log cabins were common, but in the 1880’s, schools were constructed with rough boards for siding. Most were one story high, rectangular in shape, with vertical or square windows, and a high interior ceiling. Roofing material was either shakes or shingles and pitched to shed rain or snow. A school bell mounted on the roof, or partially enclosed within a belfry, was common. More often than not, floor plans were haphazard. Whatever worked seemed the rule in arranging the room. Schoolyards were usually roughly cleared fields with “Boys” and “Girls” outside toilets located at opposite corners of the yard. Generally, playfields were unfenced. During the late nineteenth century, playground equipment was limited to rocks, logs, a tree or two for swings, and an open space for running races of playing baseball. IN the early 1900’s, many schools installed wood frame swings. Water was drawn from a well or a spring and carried by bucket to the schools. In the entry hall of most one-room schools were hooks to hang coats and hats, a washbasin on a stand, and a water pail with a community dipper. In the central room, there was the large pot-bellied stove, teacher’s desk, flag, recitation bench, unabridged dictionary, blackboards, reading and map charts, globe, and fifteen to twenty desks. Sometimes there was a bookcase against one of the walls. The earliest school in the Harts Lake area was Horn Creek School. 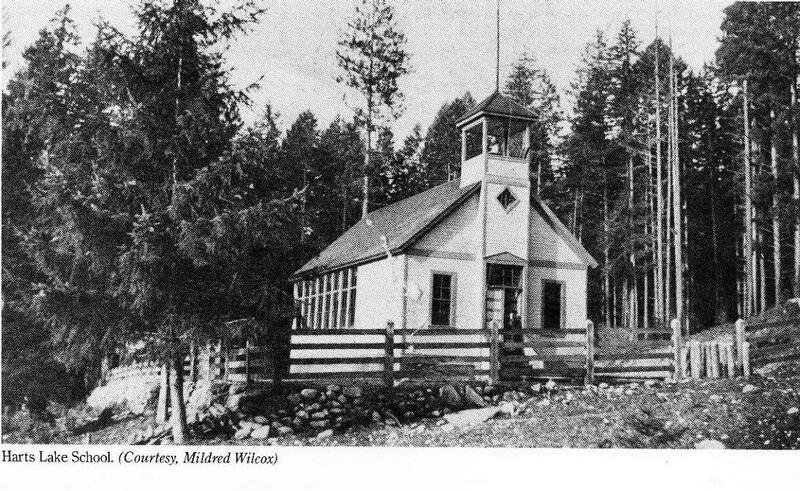 This pioneer school began in a 20’ by 30’ crude shack deep in the forest beside Horn Creek, which flows southwesterly, crossing the present Harts Lake Loop Road twice before flowing into the Nisqually River. The exact year of the school’s construction in unknown, but it was operating in 1884 as Pierce County School District No. 64. Like most one-room schools, enrollments at this school remained small, probably never exceeding 18 students in any year. During 1912, a new Horn Creek School was built about a mile farther up the creek on the north side of Kukuk Hill, at the present junction of the Loop Road and 364th Street. The new school operated until 1928. Then the building was sold for $60 and in 1930 was either moved or torn down. Three miles south of Horn Creek School, a makeshift family school was started in the late 1880’s by Sophia Horsfall in her log cabin home. She and her husband, Benjamin, were immigrants from England, and they came to Washington Territory by way of Illinois in 1887. The Horsfalls became the first permanent homesteaders on “the point” of land that forms the north hillside of Harts Lake. Shortly afterwards, Loren Golding and his father Thomas, who were from Indiana, homesteaded on the east side of the lake. In the 1890’s, four new farm families settled in the Harts Lake area. S. A. Ravnum, originally from Norway, came by way of Dakota Territory; Robert Landis Golding, Loren’s brother, came from Indiana; Charles A. Maglaughlin from Texas; and George W. Howard from Missouri. By the late 1890’s, a small schoolhouse with rough siding was built near the top of Bennett Hill. this first Harts Lake School was officially designated as Pierce County School District No. 50. Little is known about school like there, but four of the teachers were Jessie Sherman, J. A. Tibbitts, Ethel Shawl, and Martha Anderson. Between 1900 and 1910, more settlers arrived. The Allens and the Bennetts came from Missouri, the Huttons from Kentucky, the Nixons from Kansas, the Moebiuses from Germany, the Smith from New Jersey, the Staffords from England, and the Wilcoxes from Canada by way of Pennsylvania. While many of the fourteen families had moved several times on their way west to Washington State, all of the settlers stayed permanently at Harts Lake, except for the Ravnums who sold to the Wilcoxes. With the arrival of new settlers, Sophia Horsfall considered the small school on Bennett Hill too small and primitive. In 1905, she persuaded neighboring families to build a new school and playfield on two acres next to the Horsfall home. The new school differed from others in the Roy area. Instead of a single planked floor, volunteer builders installed three layers of planed lumber carted by wagon from the Horn Creek sawmill. Exterior walls were also planed and painted gray. Water was piped in from a nearby stream. Harts Lake was larger in size than most rural schools, better designed, and more attractive to the eye. Builders meant the school to be an enduring part of their community, and although its present condition reflects repair and partial reconstruction, the original craftsmanship is sill clearly evident. On a clear day, we could hear the school bell ring a half hour before school. It was a happy ring and we were off to a beautiful adventure in the woods [with] huge virgin Douglas fir trees all around us. We observed the changing seasons, felt the protection of the overhanging trees, and tasted sweet salal berries in the fall and wild strawberries in the spring. Occasionally, on a warm day we would stop, lie down on the thick green moss, and enjoy the foliage and the flowers. Other former students recall taking a roundabout way to Harts Lake School to satisfy their curiosity or to walk with others. For example, Marjorie (Nixon) Burton, who went to Harts Lake from 1921 to 1927, recalls walking to and from school with other children who lived in a nearby logging camp. Once in a while they could ride a logging train which passed beside the school, a ride that was “a lot of fun” and added incentive to walk the extra mile and a half. Because of the long walk to and from school, it was common during winter months for students to leave home when it was barely light ad return in the dark. Rain and snow made walking troublesome, especially when pathways became flooded or icy. Mona Helmer, teacher at Harts Lake in 1928-1929, remembers that winter was very cold, so cold Harts Lake froze and snow piled high on the ground. Nonetheless, students frequently arrived early for school, and one morning when she unlocked the door at 8:00 a.m., she discovered the inside temperature was only 18 degrees above zero. There were times when weather conditions were so severe that children were kept at home, but for the most part, winter travel to school was an expected inconvenience. During snowy, cold weather the Wilcox children often rode three deep on a work horse to Harts Lake School. The Loney children remember wearing boots to overcome constant water problems on the way to Horn Creek School from their family farm on the Allen Road. In bad weather parents sometimes took their children to school in a wagon or sled pulled by a horse. By the 1920s, a few students enjoyed the luxury of getting a ride to school in a car. Yet, in the case of Gertrude (Horsfall) Smith, who attended Harts Lake during the 1914-1915 school year, living three miles away was too far. She boarded with her grandparents during the week and went home on weekends. 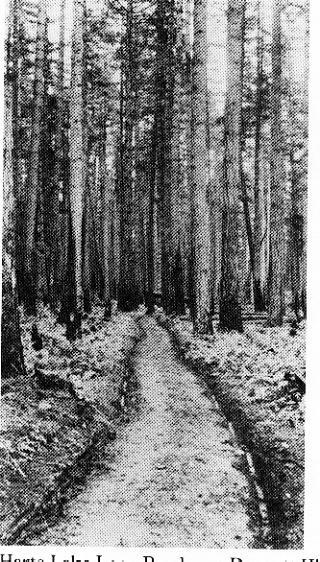 Before logging camps came to Harts Lake in 1921, walks during early fall and spring were the most memorable. Crisp air, autumn colors, clear streams, sounds and sights from the deep forests, and the profusion of spring growth gave students an unforgettable wilderness experience. It was the time in Harts Lake history when nature clearly held the upper hand. Walking to and from school students remember seeing deer, coyotes, squirrels, birds, and occasionally a bear. A child’s wonder at seeing a bear on the way home from Horn Creek School one day in 1905 was expressed in a forthright manner when Alfred Loney told his mother, “I saw a different kind of black dog walk across the road.” His brother, Conrad, had a different experience with wildlife while on his way to the same school in 1910. Conrad had a trap line that he checked every morning. One day a large skunk, caught in a trap, made a direct hit on Conrad. He continued his walk to school, but his stay was brief. The teacher decided his contribution to education that day would be better served at home. Sometimes the silence and loneliness of the woods unsettled the solo walker and even couples. On windy days when trees rubbed against one another, or on rare occasions when a real or imaginary timber wolf or cougar was heard, but not seen, a boy or girl may have thought twice about walking to school the next day. Eventually, loggers, locomotives, and fires, particularly the 1923 blaze at Harts Lake, eroded the overwhelming presence of the wilderness. New logging camps, which provided housing for workers with families, increased school enrollments. From 1905 until 1921 Harts Lake School enrollments ranged from 10 to 17 students, all from farming families. When Logging Camp Nine was established by the McKenna Lumber Company near Harts Lake in 1922, enrollment increased to 19. In 1923, the peak year in logging production, enrollment reached 31, but in 1924, dropped to 24. After McKenna Lumber moved Camp Nine to Bald Hills in 1925, there were only 11 students. We lived in a small house mounted on skids along the railroad track. When the camp moved they would load the house on a flat car and proceed to the next location…It was a great experience for a boy visiting the single loggers in their “bunkhouse.” Another wonder to me was visiting the “cookhouse” where the loggers dined. The amount and variety of the food was only equaled by their appetites after working in the woods all day. As I remember the bounteous fare, they could even have pie or cake for breakfast. The length of the school year and classroom hours were set by the Washington State Board of Education as part of its funding formula. From 1905 until 1916 rural schools were required to hold school at least 100 days, usually from late September until the first week in May. After 1916 the Board mandated 171 days so that school began during the first week of September and closed the second week in June. Each school day started at 9:00 a.m. and ended at 3:30 p.m. Within six and a half hours were five hours of instruction, two fifteen minute recesses, and a one-hour lunch period. According to former students, it was customary at Harts Lake School for pupils to line up outside by grade level before starting classes. George Nixon, who went to Harts Lake School from 1919 through 1923, remembers that first graders were at the front, and other grades followed with eighth graders last. Stella (Bennett) Peissner attended the school between 1907 and 1914. She recalls that girls and boys formed separate lines, marched in and stood at attention until the teacher gave permission to sit down. Mrs. Peissner adds that they also stood up and marched out at the end of each day. While proper decorum may have been the rule at the beginning and end of the school day, recess and lunch time were completely different. Grace (Wilcox) Bargreen, who attended Harts Lake from 1915 to 1923, remembers leaving the schoolroom yelling “batter up!” and the first one to say it was first batter up. After the morning flag salute, a song and calisthenics, the teacher devoted about a half hour to each class, beginning with first graders. She explained lessons and listened to pupil recitations. Marjorie (Nixon) Burton recalls when students were asked questions by the teacher during their half hour conference, frequently another student somewhere else in the room would answer before the assigned student. While the teacher worked with each class, other grades kept busy at seat assignments posted on large blackboards. The Washington State Board of Education required all teachers to post daily class assignments “in a conspicuous place in the school room.” Board regulations also required pupils to do “regular exercises in composition and declamation.” At Harts Lake School, the School Register records show that each student gave two recitations daily. Of course there were learning activities in which all students participated. Grace (Wilcox) Bargreen remembers, “In Geography the teacher would pull the big maps down over the blackboards and talk [to all of us] about our country and the world.” According to Mrs. Bargreen, another teacher taught “measuring” by carrying a yardstick around the room and measuring everything while all eight grades watched and listened. During the first years of the 20th century, school regulations prescribed top a standard curriculum for all of Washington state primary schools. Required subjects at each grade level include: Arithmetic, Geography, Grammar, Hygiene, Reading, spelling U.S. History, and writing. Attempts are made to expand the basic curriculum offerings at both Harts Lake and Horn Creek. In 1915, Pierce County Superintendent of schools, Lee L. Benlow, instituted manual training that is industrial arts for boys and domestic science or home economics for girls Benbows innovations however did not last in rural schools. Manual training and domestic science were offered periodically after the first year probably because most rural teachers were un-prepared to teach these new subjects. I went one year to the old Horn Creek School, and then moved over to the new school, which was farther to walk to. Went to Brant School for the last month in the eighth grades to finish up and take the state exams. Have a graduate certificate from that school. Then I returned to Horn Creek for the 9th, 10th and 11th grade. The school didn’t offer a 12th grade so we just quit going to school after that. Another subject that interested many students was geography which offered opportunities to draw and study maps. “Mental Arithmetic,” that is, adding, subtraction, and dividing without benefit of pencil and paper, also appealed to students. Often contests in other subjects were created by choosing sides and answering questions asked by the teacher. Chores, something all Harts Lake children were accustomed to at home, were also a part of school life. The older boys kept the fire in the pot-bellied stove burning by bringing in chopped firewood from the 20-to 25 cords stored in the shed outside. Girls helped the teacher prepare lunches, which were heated on the stove. At Harts Lake teachers and students prepared spaghetti, potato soup, macaroni and cheese, and other simple dishes. Horn Creek students preferred soup, particularly the brand Oxtail Soup. There were other chores such as raising and lowering the flag, cleanup after school and preparation for special holiday programs. Sometimes older students assisted the teacher with the lower grades by listening to the young read, spell, and do their multiplication tables. Occasionally, parents of students assisted the teacher. School days were not all work. Playtime at both recess and lunch was eagerly awaited by students. Games played at Harts Lake and Horn Creek were basically the same enjoyed by all country schools during that era. Former students recall playing the following games: Anti-Over, Baseball, Beckon-in-the Woods, Drop-the-Handkerchief, Duck-on-the-Rock, Farmer-in-the-Dell, Foot Races, Fox-and-Geese, Hide-and-go-Seek, Hopscotch, Oats-Peas-Beans, Pump-Pump-Pull-Away, Ruth-and-Jacob, and Soccer. Gilbert Cloran, who attended Harts Lake from 1926 to 1929, recalls playing soccer beside the schoolhouse and keeping score on one of the building’s painted boards. “We always had to wash off [the score] after the game; even the little ones had to help.” George Nixon liked “Fox-and-Geese” best of all the games. All of the students but one formed into a big circle. They were the “foxes.” One student, the “goose,” stayed in the center. Each person in the circle tried to win by getting to the center without being touched by the “goose.” On the other hand, if the “goose” touched a “fox”, then they traded places. At first, Harts Lake students played on a small, unimproved piece of land adjacent to the Horsfall property. Later the area was graded into a schoolyard, but the playing surface still remained rocky. The major cause of absenteeism from 1902 through 1930 was sickness. If a student became ill at school, a cot was provided to lie on. If the illness became more serious, another student accompanied the sick child to his or her home. In those days, a home was quarantined by the county health officer if a member ad a communicable disease such as chicken pox, measles, mumps, whooping cough, or the flu. If a sister or brother was quarantined, others living in the house were kept out of school as well, or as an alternative were under the care of a family doctor or treated with home remedies. Students also missed school because of seasonal work demands on the family farm, severe weather conditions, or simply playing “hooky.” Mabel (Loney) Martinson remembers an unusual day at Horn Creek when she and her teacher, Betty Carmen, walked to school together only to discover that no one else was there. Apparently deep snowdrifts had kept the other children home. The two of them held school anyway. That day when Mabel (Loney) Martinson and Betty Carmen held school was not typical. High attendance was common, even in the worst of weather, because for every day that school was cancelled, a day was subtracted from the Christmas or spring vacation. Schools were paid on the basis of student daily attendance, and generally there was little leeway in budgets for lost days from the school calendar. Discipline was a major concern of the Washington State Board of Education. The Board’s instructions were specific about student behavior. “Teachers shall maintain strict order and discipline in their schools at all times. Any neglect of this requirement will be considered good cause for dismissal.” Harts Lake teachers were required to note in the School Register the number of cases of corporal punishment, suspension, and expulsion. From 1902 through 1915 Harts Lake teachers used corporal punishment ten times, and suspended two students, but no one was expelled. Usually if a student misbehaved in the classroom, he or she was sent to the coat room as a disciplinary measure. The students gained “sweet revenge” on another winter day that same year. During the lunch hour they were allowed to go “coasting” (sledding); on Bennett Hill. Since the teacher was unfamiliar with the area the students told her to ring the bell when it was time to return. Off they want laughing, shouting and “coasting” long past the end of lunch hour. Whether the little rascals could hear the bell, or deliberately ignored it, no one is saying to this day. When they failed to return on time, the teacher intercepted the mailman and asked for directions to Bennett Hill. It was time for afternoon recess when she finally caught up with the hooky players. The rest of the afternoon they sat in their seats memorizing poetry. Up the road at Horn Creek School, Arthur Loney remembers asking his 5th grade teacher for help with arithmetic. The answer he received was, “I’m too bus. Do you want a licking?” While that response was unmerited, his brother, Alfred, did deserve a reprimand from his Horn Creek teacher. On the last day of school in 1914, he placed two firecrackers saved from the 1913 Fourth of July under the desk of a “bully-type” classmate. When the explosion went off with a bang, the unsuspecting student “jumped at least two feet” in the air. Even the teacher thought it was a “good joke” on the victim. Before September 1, 1919, not even a high school diploma was required to be a Washington State teacher. Prospective teachers took a test based on the State Course of Study. If the applicants passed, their names were entered on the county teachers’ register. Prospective teachers had to demonstrate derailed knowledge of reading, writing, spelling, arithmetic, American history, and physiology, as well as Washington State School Law. Once past the contemporary examination, successful candidates were placed on the Count Teacher’s Register. The Register listed an applicant’s name, test grades, age, birthplace, and teaching experience. School Board members consulted the Register, interviewed registrants, and signed a contract with the person of their choice. The contract was countersigned by the school district clerk who sent a copy to the County Superintendent. Teaching in a one-room school could also be physically exhausting. In addition to instructing, teacher contracts specified janitorial duties. And the teacher was responsible for planning, hosting, and clean-up of the Halloween, Christmas, and spring programs. Besides there assignments, evening hours were spent preparing subject lesson plans for each grade level. Despite these numerous duties, one-room teachers such as Louise Kuhlers and Mona Helmer appreciated the direct and daily contact with students. Neither ever regretted beginning their professional careers at Harts Lake. The first teacher records of Harts Lake date from 1902, when the old schoolhouse on top of Bennett Hill was still in operation. Beginning on October 6, 1902, and ending March 6, 1903, J.A. Tibbits taught seven students ranging age from seven to seventeen. Those students were Claude Ayers, Edwin Golding, Arthur Horton, Fred G. Howard, and the three Ravnums, Albert, Harry, and Susie. This Harts Lake class barely achieved the requirement of seven students, the minimum at that time to qualify a school district for state financial support. Tibbitts taught the prescribed Washington State Course of Study, and received $35 a month. Since there were no Parent Teacher Associations in the early years, parents demonstrated interest by visiting the school several times each year. Parents signed the Harts Lake School Register, but did not write comments. Because there was no district superintendent or school principal, the Pierce County Superintendent of Schools were required by state law to annually inspect each rural schoolhouse. After the inspection, the County Superintendent sent a written report to the local school directors. The County Superintendent’s report analyzed the strengths and weaknesses of instruction, student performance, and budget, as well as the physical condition of the school and its equipment. Periodically, the Harts Lake School Board visited the school and held open meetings to discuss problems and ascertain needs. The principal responsibility of the board was hiring a teacher; however, other duties included developing and managing the school budget, ordering supplies, and supervising the maintenance of the building and equipment. A study of Harts Lake budgets from 1918 to 1930 reveals how the school was financed. In 1923-1924, the school enrolled 31 students. That year the school started with $1,155.76 cash on hand. During the year, the district received $722.81 from the state, $406.87 from the county, and $875.51 from the local millage. Expenses were $1,170 for the teacher’s salary, $94.20 for instructional materials, $183.37 for maintenance costs, and $20 for insurance. There was $559.40 in uncollected taxes from the previous year. The school had neither bonded indebtedness nor a building fund. During the twelve years studied, the board never overspent its budget. In contrast, Horn Creek School, which had 9 students in 1923-1924, received $279.60 state aid, $174.13 county support, and $476.52 local millage. The teacher’s salary was $1,165, while instructional materials and operating costs approximated Harts Lake. Horn Creek’s contingency fund, $230.79, was used to help balance its accounts. School district board members were elected for one-year terms until 1912, when the State Legislature changed their tenure to three years. harts Lake School had a stable board. During its 28 years, John N. Allen served 20 years, Robert Landis Golding 17 years, Sophia Horsfall 9, William Horsfall 11, and Judson M. Wilcox 12. Sophia Horsfall also served as the school district clerk for 17 years. At the end of each school year, Harts Lake teachers were required to count all books and supplies. The completed list was handed to the School District 306 Clerk. In turn, the Clerk and School District Directors, after personally surveying the school’s property, signed the School Register confirming that the “movable property inventory” and school records were in proper order. The Harts Lake School Register notes that Tibbitts was followed by Martha G. Anderson in 1903-1904, and then Ethel G. Shawl during 1904-1905. They were paid $35 a month for 20 week terms. Enrollment for both school years remained low, only eight students registered with Miss Anderson and six with Miss Shawl. Under the direction of teachers Anderson and Shawl a library was started at the school. The Abbe Constantin, Prue and I, Donovan, Bird World, The Minute Boys of Lexington, How to Make the Best of Life, Good Manners and Success, The Little Lame Prince, and Pilgrim’s Progress were the first books purchased for outside student reading. The first teacher in the new school was Charlotte Driskell who received $45 a month for the seven-month school year. Records indicate Miss Driskell did a commendable job and was rehired at $50 a month for 1906-1907. For more than two decades following Charlotte Driskell’s pacesetting years, twenty-one women teachers met the basic educational needs of Harts Lake students. Overall, the Board hired well-qualified teachers. According to the Pierce County Teachers’ Register, six were university graduates, eight held “Life Teaching Certificates,” four qualified for “Second Grade Certificates,” and three were temporarily certified. Mobility was the prime characteristic of teachers at Harts Lake, Horn Creek, and other one-room schools in the area. Of the twenty-one teachers who taught at Harts Lake from 1905-1930, only Ann Beckwith, Charlotte Driskell, Retta Chambers, and Claire Giblin stayed longer than one year. Salaries were an important cause for teachers leaving rural schools. From 1902 until 1920, the monthly teachers’ salary at Harts Lake increased from $35 to $85 a month. By 1930, the last year the school operated, pay was $115 a month. In comparison with salaries paid other Washington State female teachers for the same years, Harts Lake School Directors paid $5 a month higher than the state average. Urban schools, however, dominated the highest end of the salary scale and provided more incentives. Since rural schools paid less than cities, it came to be expected that most country schoolteachers would move after a year into higher paying city positions. Living conditions were another cause of high teacher turnover in Roy area one-room schools. Many teachers were without their own means of transportation, unaccustomed to staying away from home for long periods, and required to bed and board at farm residences. Nineteen of the twenty-one Harts Lake teachers stayed next door to the schoolhouse at the Horsfalls. The Horsfalls were hospitable and willing to help, but young city girls found farm life trying. The diet was restrictive, and the social routine was limited to an occasional dinner out with another farm family, or an evening playing cards with the Horsfalls. During the early 1900’s, if a teacher needed to go on a weekend to Tacoma or Puyallup, it was quite an undertaking. She had to have someone take her to the McKenna or Roy train station by horse and buggy, then come back and get her when she returned on Sunday evening. Teacher mobility and social life improved during the late 1920s. Mona Helmer recalls going to a movie and having a soda afterwards on Wednesday nights in McKenna with Joe Allen. Joe was the same age, 19, and owned a Model T. Louise (Wall) Kuhlers bought her brother’s Ford before she started teaching at Harts Lake, and made the round trip between Tacoma and harts Lake every weekend. Even with improved transportation most teachers moved on, either to marry, find another teaching job, continue their formal education, or find a new career. They were just wonderful teachers, they had everybody interested in learning, and when it came to recess time they’d get out and play just as hard as we kids did. They joined in all the games and things we played and they were just that way. I don’t think there was anyone who didn’t like those teachers. Both George Nixon and Stanley Morris remember Margaret Mossford as a “very good” teacher with special ability to help students having trouble learning their lessons. Bertha (Golding) Smith considers Mae Chambers “a very dedicated teacher” who spent her life educating the young. And Helen (Wilcox) Goldsmith recalls her best teacher was Mattie Emory who, while strict, taught the girls to weave with needle, and thread. Miss Emory was also the favorite teacher of Marion Klarich. Born in Austria’s Slovenia province, Klarich had only been in the United States six months when he started school at the harts Lake in 1921. Miss Emory saw to it that Klarich and the two Stinich girls, Anna and Mary, learned to read and write English. Klarich says he had already learned to speak English around the lumber camp, though some of the words were not “proper English”. The pupils were busy weeks ahead-making chains of colored paper, cutting out stars and lanterns to decorate the tree which on the long awaited night gleamed with lighted candles. A bucket of water nearby was considered an adequate safety precaution in those days. Santa passed out bags of hard candy; each pupil had his or her time upon the stage. Finally, after a round of carols, candles extinguished, the schoolhouse dark, parents and children returned along rutted roads to their homes. As long winter nights and confining days gave way to spring, there was a renewal of energy both in the community and in the schoolhouse. To students, spring brought thoughts of summer when they could disperse to other activities. For eighth graders, the end of school meant state examinations and earning coveted graduation certificates. Mona Helmer recalls taking two 8th graders on a boat ride and picnic lunch between exams during June, 1929. A comparison of Harts Lake students with others who took statewide examinations from 1906 through 1930 indicates that, overall, Harts Lake eighth graders consistently ranked above the state average. In 1906, Lessie Hutton and Fred Howard were the first harts Lakes students to take the exams. Both Lessie and Fred were outstanding, that is, above the 90%, in reading, writing, spelling, arithmetic, and physiology. Both received above average grades of 80% in grammar and geography, and average grades of 70% in civics and U.S. History. In the reading section, one of the questions required students to write four “memory gems” in not less than 20 words each, and one question in the history and civics part had students define primary nomination, woman’s suffrage, and local option. The physiology section asked students to describe what they would do for an “apparent drowning,” and one of the math questions asked students to find out the earned interest on $1,275 for 3 years, 2 months, and 15 days at 8 per cent. The highest grade on state examinations earned by a Harts Lake student occurred in may 1924, when Helen Wilcox scored 833 out of a possible 880 points. Helen ranked 28th among 469 Pierce County students passing the examination. From 1906 through 1930, all Harts Lake students who took the eighth grade examinations passed, a notable tribute to themselves, their teachers and parents. Customarily, a small celebration followed the announcement of eight grade examination results at the school. Most graduates ended their formal education at the point. Others went to Roy or Yelm high schools, and a few continued their education at the college level. Quickly, their years at Harts Lake School became only memories. I drove the first school bus out of Harts Lake. The car was made out of an old army wagon put on a Model T in 1925. I drove it to Roy. had a full load of 25 students. Went by way of harts Lake to Pincus Hop Ranch and then into Roy. Picked up children all along the route. Most of them were high school, but some were grade school kids I picked up. I went to school too. The rural school is no longer a community center for rural life. The “literary societies” and “spelling bees” of primitive times are almost unknown. The rural school is no longer a stimulating, organizing, socializing force in the community. No doubt many communities challenged this conclusion and the entire report itself. While the commission report did not apply closely to Harts Lake, which continued as a school for another ten years and as a community center for forty years, it did signify the beginning of the end for most country schools. In Pierce Country, 55 one-room schools operating at the turn of the century had dropped in number to 33 by 1924, and to 17 by 1930. It was a time when there was a big controversy over Harts Lake. Yelm wanted it, and Roy too, for the tax revenues. Both had more classes, especially manual training and agriculture, which appealed to the students. They also had 4H. Yelm was the larger school. The army ruined Roy by taking all the prime land, and people left. The Harts Lake people wanted to go with who could offer the most for their children. Another factor that influenced the consolidation issue was the decline of population in southwest Pierce County. Between 1920 and 1930 over 100 people left the area. One reason is that logging began to taper off in the company camps between McKenna and Harts Lake. Another contributing factor, especially after 1929, was a decrease in the number of family farms because of bank foreclosures. It was the beginning of the Great Depression. Harts Lake School enrollment between 1925 and 1930 was erratic. Although there were 20 students in both the 1926 and 1927 school years, only 14 came in 1928. The lowest enrollment since 1904 occurred in 1929 when only six students registered. Furthermore, enrollment decline forced the cost for educating Harts Lake students in their one-room school to the prohibitive level. The 1930 Harts Lake School budget was $5,374.01; almost four times higher than the total 1929 budget of $1,422.07. Local tax assessment had increased the most, from $582.45 in 1929 to $2,305.52 in 1930. Recognizing the dual advantages of lower taxes and a more comprehensive curriculum for their children, Harts Lake citizens decided to consolidate with another school district. Both Roy and Yelm School Districts offered to consolidate with Harts Lake, but Pierce County Superintendent of Schools Howard J. Fisher insisted the first vote should be on a merger of Harts Lake with McKenna Schools. On May 3, 1930, Harts Lake and McKenna citizens voted 37 to 0 in favor of forming District No. 341. Harold Snodgrass was a first grade student at Harts Lake the year the school closed. He remembers very little discussion at home on the consolidation issue. His sadness about Harts Lake closing ended “when a brand-new 1930 Dodge Brothers school bus pulled up in front of the farm.” Snodgrass, along with twe3lve other Harts Lake students and their teacher Louise Sommers, all went to the four-room school at McKenna to begin the fall term in 1930. In 1942 McKenna School District consolidated with Yelm District, and today, Harts Lake students are bussed to Yelm. Thus ended the saga of Harts Lake’s one-room school. From 1899 until 1930, approximately 150 young people had received their basic education and made life-long friendships. My impression of the one-room schools is that what they may have lacked in fancy buildings, they more than made up for in the unique environment that they furnished. There were three in my class [at Harts Lake School]: William Moe, Helen Wilcox and myself. Being in a small class, it seemed easier to learn. Miss Mossford, the teacher, was a very good teacher and if one needed more help, the older children would help you. I believe that the older students felt that they were kind of responsible to set an example for the younger ones. This tended to create a warm fraternal learning atmosphere. It is no wonder that those who had attended one-room schoolhouses came to look back on their school days with pride and nostalgia. They were not alone. Across the nation the idea of “the little red schoolhouse” had already gripped the American mind. Since it was an integral part of the pioneer experience, we think of the one-room school as a symbol of rugged but healthy and honest traits: hard-fought independence, and enduring work ethic, and down-to-earth neighborliness. In retrospect, we are left with the conclusion that the one-room school tradition did indeed reflect those traits. This small book is based primarily on 28 interviews gathered in 1983 and 1984 from former students, teacher, and townspeople who lived in the Roy area between 1905 and 1930. The personal recollections of former students were fundamental in recreating farm, school, and town life during that era. Moreover, personal interviews with three former Harts Lake School teachers, Eudocia (Bair) Leech, Louise (Wall) Kuhlers, and Mona Helmer, added an important dimension to the book. Interviews with former and long-time Roy area residents were also valuable in providing historical, social, and economic perspectives of the Roy-McKenna-Harts Lake area. Especially important were the extensive files in the Charles Throssell Collection which are located at Pacific Lutheran University. Throssell was a Rural Free Delivery mailman in Roy for 41 years. He kept detailed records of homesteads, townbuilders, pioneer schools, mail routes, and other items of historical interest. Statistics concerning Roy and surrounding farms were drawn from Pierce County Directories for the years 1911 through 1915, the Oregon and Washington Gazetteer and Business Directory from 1903 through 1915, and the Washington State Farmers’ Directory, Pierce County, 1921-1922. All are located in the Northwest Room of the Tacoma Public Library. County plat maps proved to be an important research aid. Kroll’s Atlas of Pierce County, 1915, and Metsker’s Atlases of Pierce County for the years 1924, 1936, and 1941 were particularly helpful in locating precisely schoolhouse sites and changes in land ownership. Other useful maps were found in D.H. White and Sons, Map of Pierce County, Washington, 1928; Wichersham’s Township Plats of Pierce County, 1900; and Fred G. Plummer, Plummer’s Complete Atlas of the County of Pierce, Washington, 1889. These maps are available in the Northwest Room of the Tacoma Public Library. Available copies of weekly newspapers published in Roy between 1911 through 1930 gave excellent accounts of day-to-day happenings in Roy, and to some extent the Harts Lake community. These newspapers were The Buzz Saw, Roy Enterprise, and Roy Recorder. Two unpublished manuscripts proved valuable as reference guides. Walter Kunschak’s, “The History of the Roy School District” (M.A. Thesis, Pacific Lutheran University, 1959), and Edgar Prescott’s “Judson’s Family: A Record of the Wilcoxes,” (1967). Secondary sources consulted were W.P. Bonney, History of Pierce County, Washington, 3 volumes, Chicago, 1927; Harry Johnson, Washington Schools in the Good Old Days, Olympia, 1969; Charles H. Seaver, Washington State Supplement, (Second Book), New York, 1911; and Denise C. Troth, History and Development of Common School Legislation in Washington, Seattle, 1927.